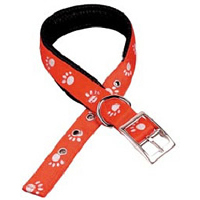 The Reflective Nylon Dog Collars are manufactured using High Quality Soft Webbing & Padded for Extra Comfort. The Reflective Nylon Paw Collars are Visible up to 400m away and use a Heavy Duty Buckle & D Ring for Strength & Durability. The Padded Collar acts as a cushion around your dog's neck for added strength and absolute comfort. The air cushion encapsulates thousands of tiny air bubbles giving this remarkable cushion effect. Nylon is one of the strongest man made fibres which is colour fast, completely weather proof, very difficult to chew through and is suitable for most breeds of dog. 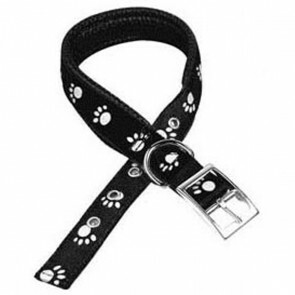 Reflective Nylon Collars: 5 stars out of 5 based on 1 user reviews. Good collar. Reflective pattern work well. Padded inside should be comfortable for the dog.